I saw this ad on the train yesterday, and read it several times out of pure enjoyment. 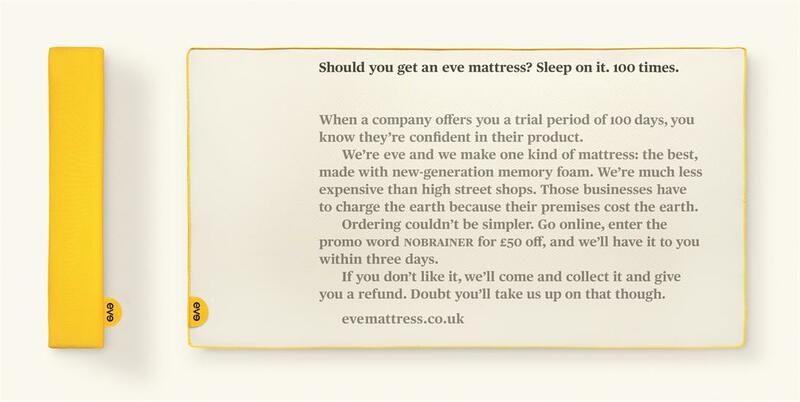 How refreshing to see the copy over-riding the visuals (because we all know what mattresses look like). What a nice, simple, sunny brand (makes sense, it’s about waking happy). I love a confident client who allows me to write in a conversational style like that. You’ll find our grand old office building tucked away behind a surprisingly residential street. Please make an appointment before you visit, and we’ll put the kettle on. If you want your brand to sound like a human, give me a call. Newsletters are dead. Or are they?